What Can Be Done About The Steep Rise in Babies Born to Opioid-Addicted Mothers? This entry was posted in Substance Abuse and tagged Opioid, Pain Medication, Prescription Medication, Preventing Misuse on September 16, 2016 by Team Addiction Hope. Legal opioid use while pregnant can adversely affect a newborn for life. The effects of neonatal abstinence syndrome (NAS) range from newborn withdrawal symptoms to permanent disabilities. There are alternatives to opioids during pregnancy, such as less dangerous painkillers. NAS is preventable, but in order to do so, we must understand why mothers use opioids during pregnancy. According to the National Institute on Drug Abuse, every 25 minutes a baby is born suffering from drug withdrawal. When a newborn baby no longer receives the mother’s supply of opioids, he or she experiences NAS. From 2000 to 2012, the percentage of babies born with NAS (from all drugs) increased from 1.2 percent to 5.8 percent. 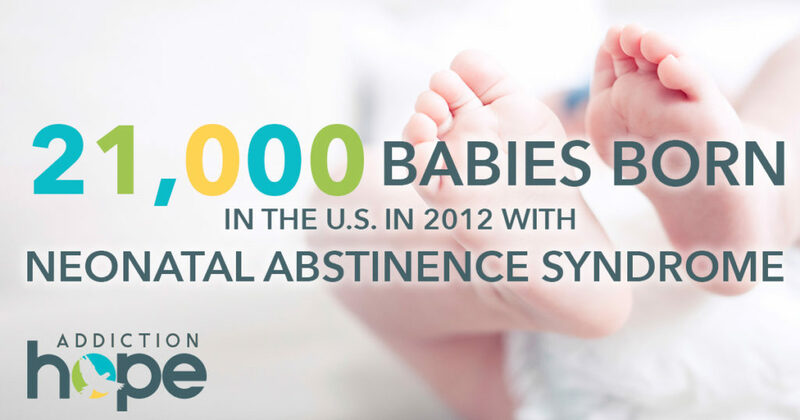 This means more than 21,000 babies were born with NAS in the United States in 2012. When most people think of drug-addicted babies, they think the mother must have abused illegal drugs. However, many mothers of babies with NAS took legally prescribed opioids. It is unclear how many of these mothers used their prescriptions appropriately, but we can trace many NAS cases back to prescription painkillers. Common types of legally prescribed opioids include codeine (found in certain cough syrups) and forms of oxycodone or morphine (used to control chronic pain). Of course, there are mothers who purposely abuse or overdose on opioid prescriptions while pregnant. Health care experts constantly seek ways to deal with this problem. Many states have implemented prescription drug-monitoring programs. These programs help reduce situations that lead to opioid abuse, such as receiving prescriptions from multiple physicians or filling a prescription at multiple pharmacies. Prescription drug-monitoring programs, however, cannot identify every case of opioid abuse and NAS. Therefore, legislators in Florida and other states are calling for statewide task forces to examine the scope of NAS in their respective states. These task forces would also be responsible for investigating long-term effects and drug prevention strategies in their respective states. Legislators hope these studies will improve education and awareness about the risks of taking opioids while pregnant, and ultimately a reduction in such drug abuse. The symptoms depend heavily on the type of opioids the mother used, how many she took, and how long she used them. If the mother used substances such alcohol, nicotine or other drugs in conjunction with opioids, a NAS baby will likely experience more dramatic symptoms. Since NAS symptoms can take up to a week to appear, newborns must stay in the hospital for observation for at least a week. In the most severe cases, newborn hospitalizations can last up to two months. The lengthy hospital stay can cost new parents thousands of dollars. In our recovering but still sluggish economy, many parents simply can’t afford the medical bills, even with health insurance. Health care professionals are the first line of defense in preventing NAS. Protecting mothers and babies begins when the doctor educates him or herself about the type of medication prescribed. Addiction psychologists recommend that doctors apprise pregnant patients about all potential side effects of opioids. When prescribing a painkiller or other opioid, the doctor must take into account factors such as the mother’s history and the risk level of her pregnancy. Doctors can and should screen mothers for opioid abuse. Regular prenatal exams may uncover abuse symptoms. If a mother must use a painkiller during pregnancy, her doctor should carefully monitor the dosage and adjust it periodically. This will help the mother avoid withdrawal symptoms and give her newborn a better chance of starting life healthy. If you became addicted to opioids while pregnant or if you are still addicted after pregnancy, you should seek help for the sake of your children and yourself. Please contact a professional rehabilitation facility for guidance. A dedicated opioid treatment program will help you cope with physical and emotional symptoms and with conquering your addiction for good.